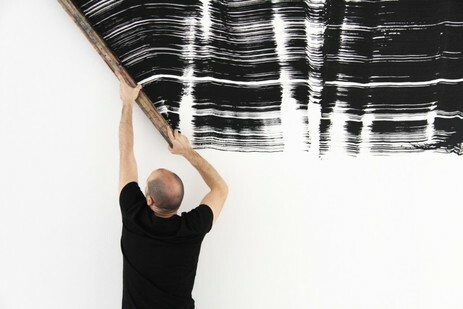 Ferran Gisbert wields a handmade paintbrush corresponding to his own height. From Performed Painting: Rosana Antolí, Ferran Gisbert, Alan Sastre and Vicky Uslé. Image courtesy the artist and The Ryder, London, 2015. Ferran Gisbert, Sign, 2014. From Performed Painting: Rosana Antolí, Ferran Gisbert, Alan Sastre and Vicky Uslé. Image courtesy the artist and The Ryder, London. 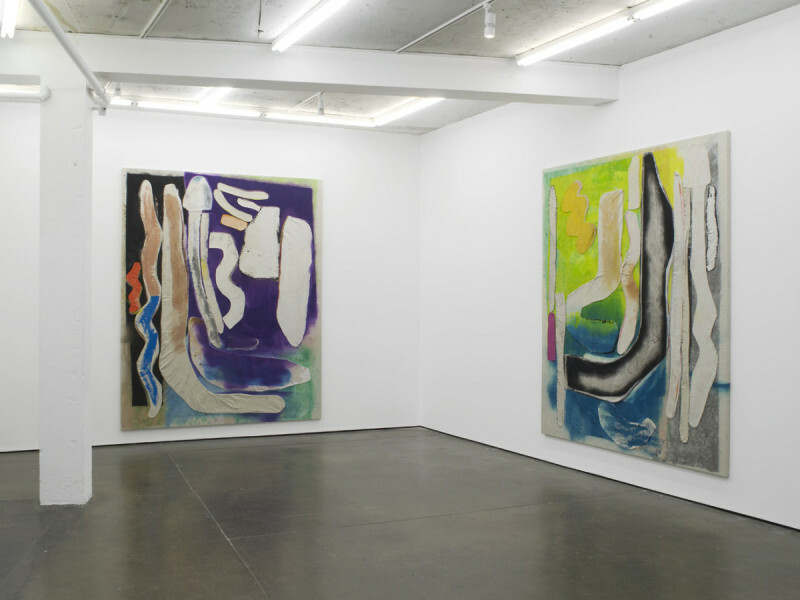 Jess Fuller, Fairy smoke, installation view, 2015. Image courtesy the artist and Herald St, London. 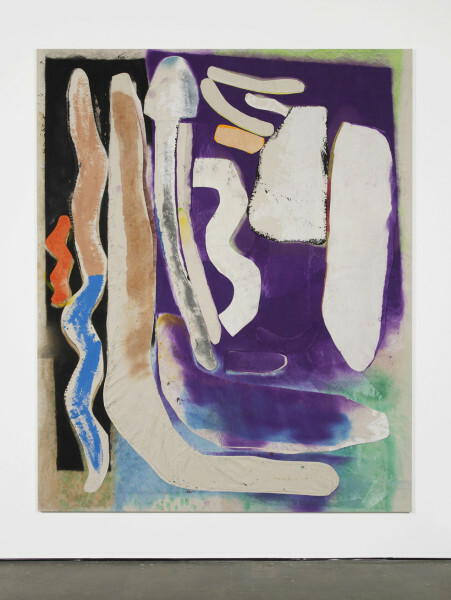 Jess Fuller, Fairy smoke, acrylic and gesso on canvas, 383.5 x 254cm, 2015. Image courtesy the artist and Herald St, London. 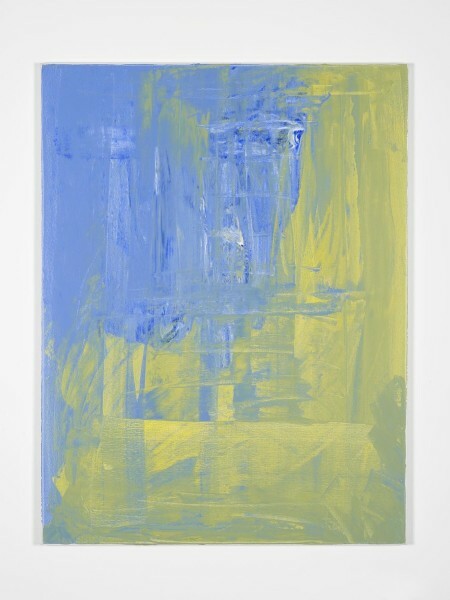 Jess Fuller, The fourthway, modest by day, acrylic and gesso on canvas, 261.6 x 212cm, 2015. Image courtesy the artist and Herald St, London. 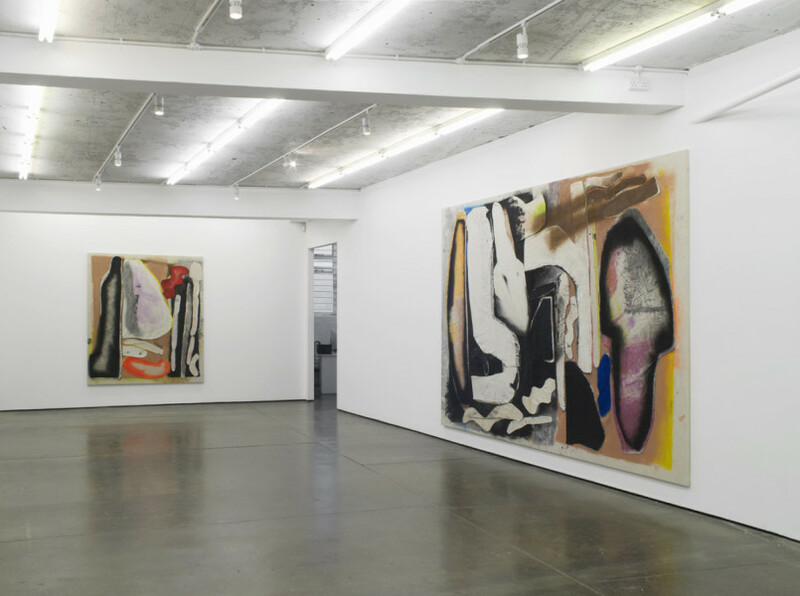 Beginning with Maureen Paley, Michael Krebber has a fourth solo show over both floors of the gallery. 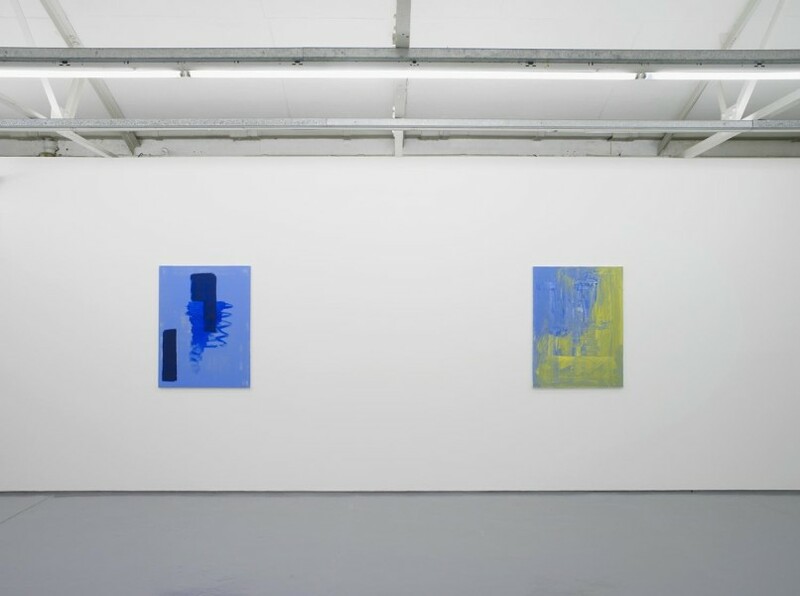 For years an influential professor of painting at the Stadelschule in Frankfurt, and before that variously apprenticed to Georg Baselitz and Martin Kippenberger, Krebber’s canvases exude a certain gnomish authority, all the while giving the viewer very little to conjure with. Compositions may consist of less than a dozen gestures in acrylic. 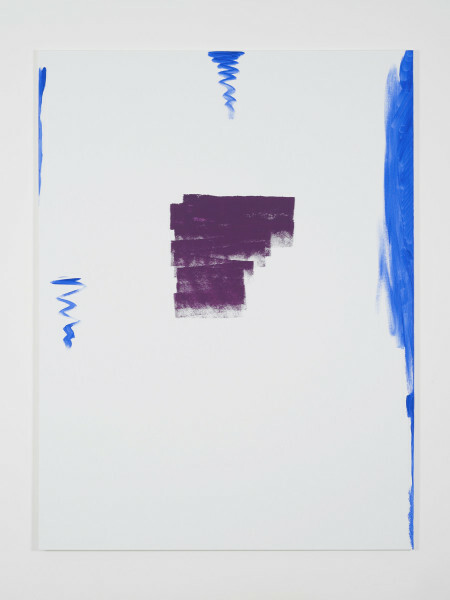 MP-KREBM-00090, 2015 comprises a single, wiggly vertical mark just to the right of the centre of the canvas. 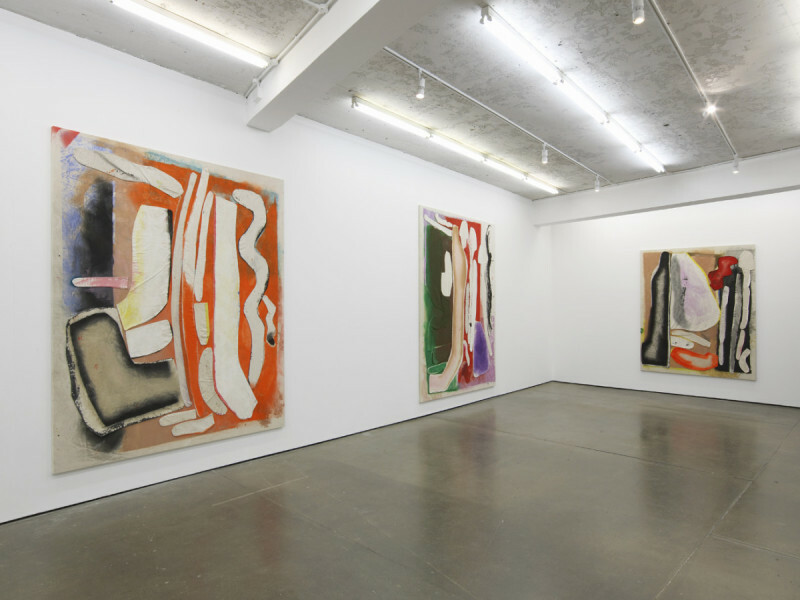 The paintings’ titles, all of which look more like inventory numbers than anything else, give no assistance. 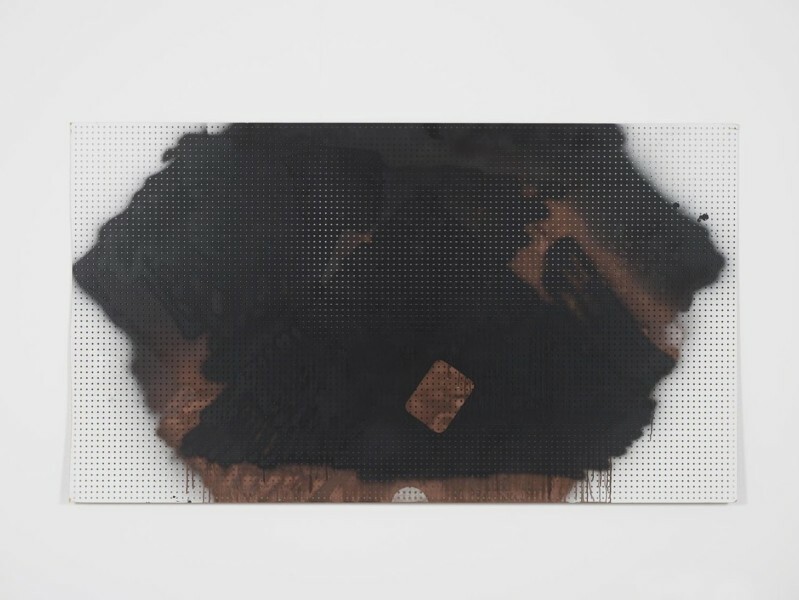 But there are works such as MP-KREBM-00091, and 00092 which develop a more complex spatial statement that helps you to read back through other, less yielding works and appreciate the zen-like poise in even the sparsest canvas. The Ryder is a diminutive new space on the same side of the street as Maureen Paley. Unusually, the door to the street is wide open; no bell to ring for entry here, and glimpsing their current show pulled me in for a closer look. 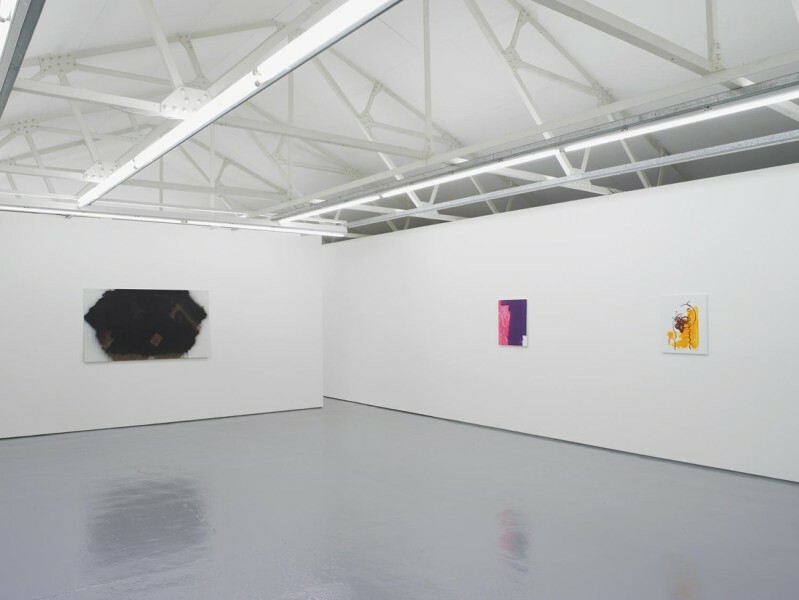 Four artists from Spain have been brought together very sympathetically in an improbably small space. All share an approach to painting that privileges the artist’s physical engagement with the medium and support. 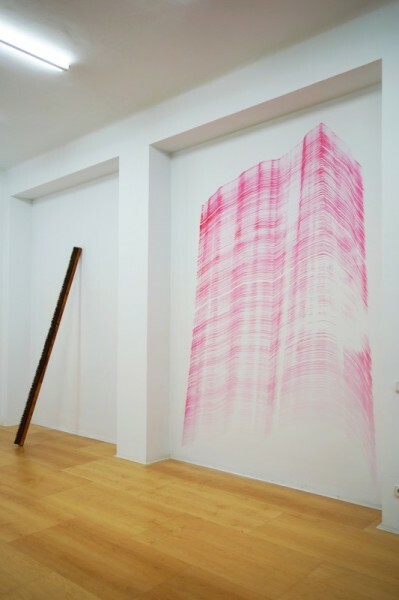 Across the back wall, Ferran Gisbert has created a single gesture using an oversize paintbrush of his own manufacture, describing the limits of his arm’s reach. 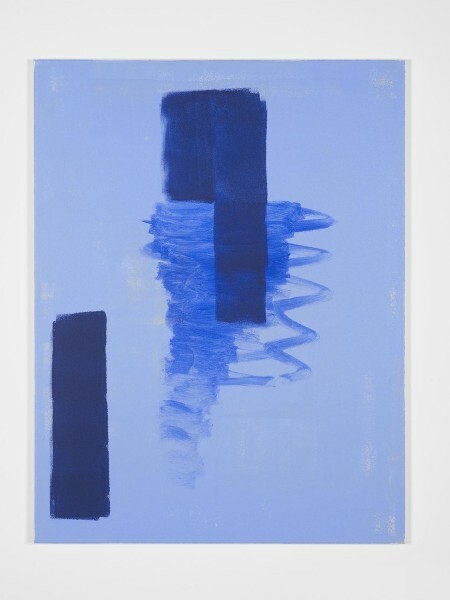 Initially reading as the casual brushstroke of a passing giant, Ferran’s painted mark falters and arcs – recording the effort of muscles holding the brush to the vertical surface, exerting pressure, imposing the will of the artist through the materials. 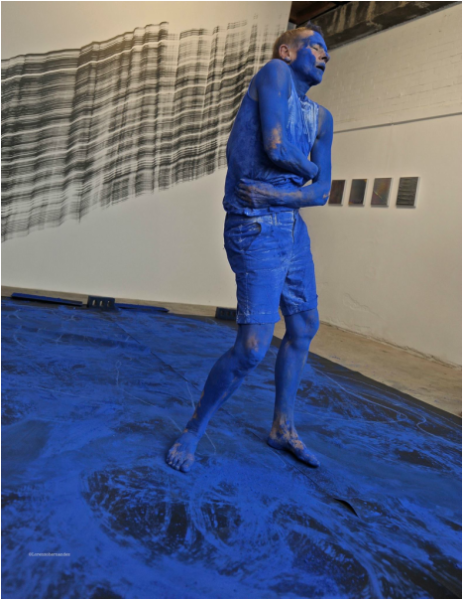 In the centre of the space is a rectangle of intense blue pigment. Rosana Antoli critiques Yves Klein’s Anthropometries, using her own, clothed, body to perform work with the famous International Klein Blue. Her performance at the gallery positions the female as active performer rather than submissive instrument of the artist – what is left after the performance is the residue of paint bearing the imprint of the artist’s movements. A small monitor shows a video of the performance. 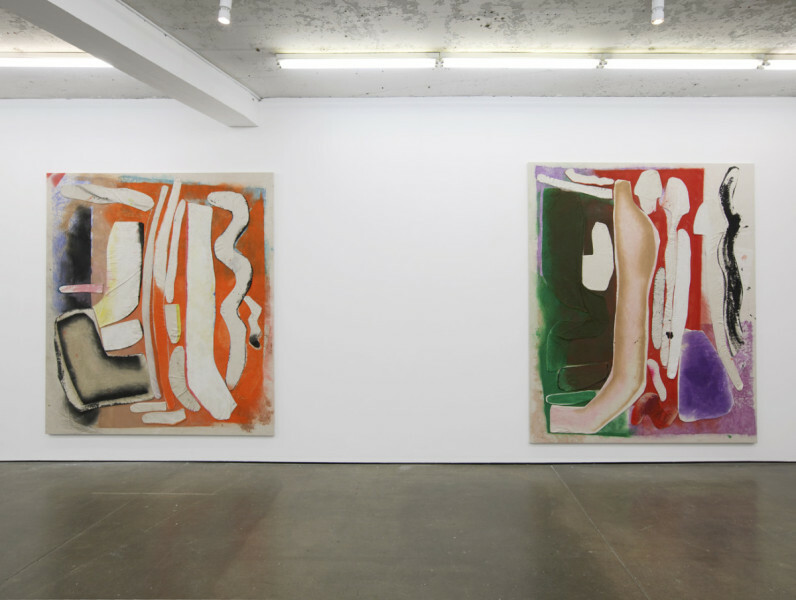 Up at Herald St gallery there is the opportunity to see new work by New York based artist Jess Fuller. This is her first show with Herald St and her first in London, although she is already quite well known in the US. 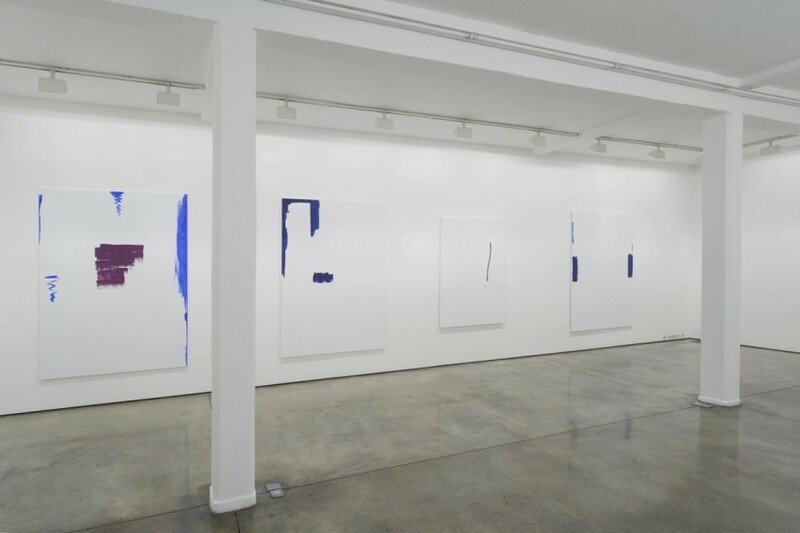 The gallery is showing six large-scale works that are utterly intriguing in the originality of their language. Fuller uses a kind of fabric collage to create a dense composition of repeating abstract forms. Roberta Smith in the New York Times referred to the shapes as looking like “empty, irregular pillowcases” and I can do no better than that. If I recall correctly, Fuller trained first in fashion, so her use of fabric has an easy explanation there. But let us not try to simplify. 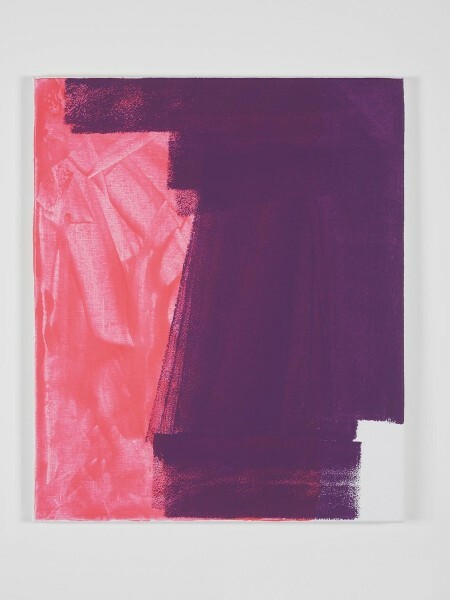 On the canvas ground, as well as over the top of the collaged fabric shapes, Fuller layers intense saturated colour – sometimes sprayed, sometimes brushed on – to create the most complex and involving compositions. I was told that some of the canvases go through the washing machine before being stretched. 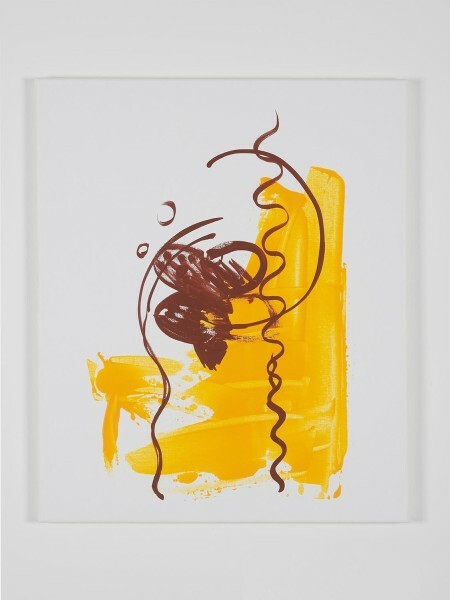 Forms repeat across works – some looking like etiolated, psilocybin mushrooms, others mere squiggles – recalling the biomorphic abstraction of mid-twentieth century figures like Arp or Moore or Miro. There is no furrowed-brow, student earnestness here however – just an amazing energy and intelligence at work.